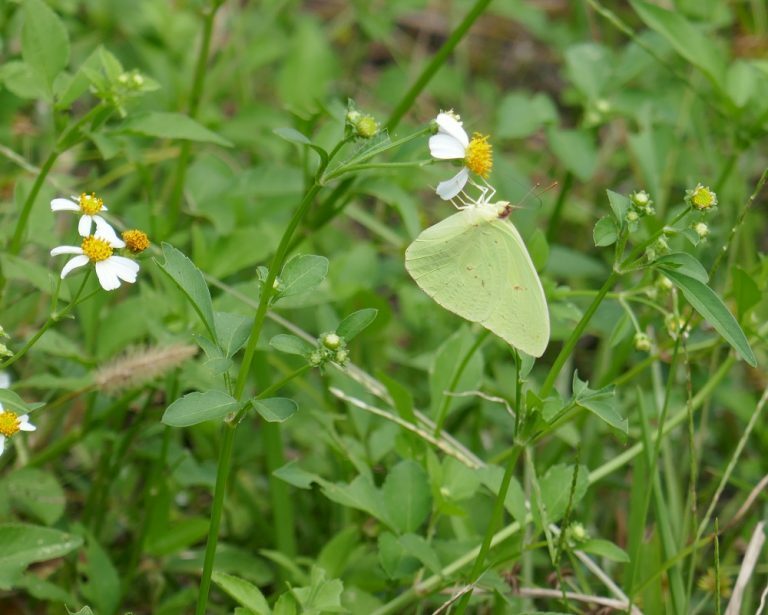 If you leave these wildflowers growing in your yard the butterflies will come for them to drink their nectar. If you do not have them in your yard most transplant very well. Generally the perennials transplant well, but the annuals usually need to be started from seed, unless you can find seedlings to transplant. 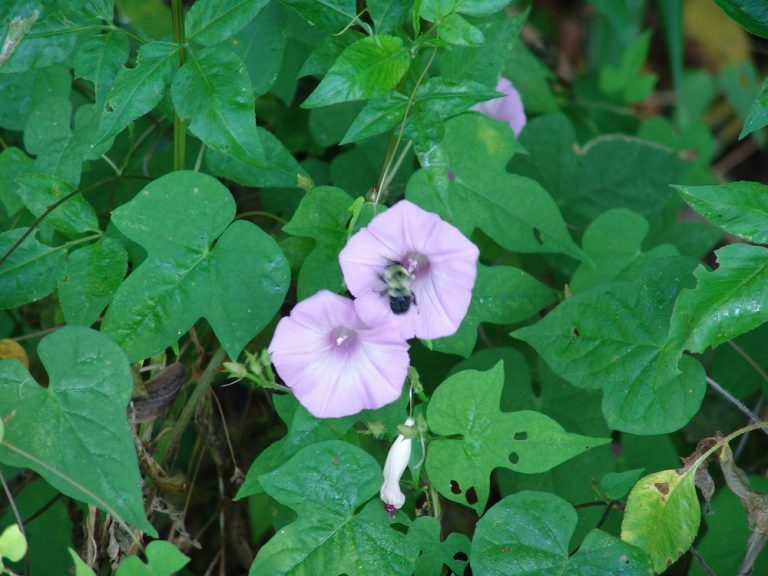 These are just a few of the Florida wildflowers that are nectar plants. 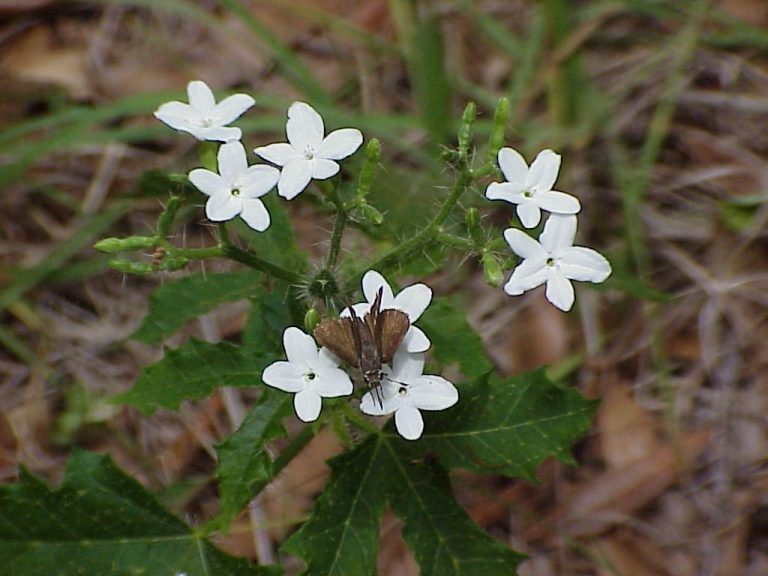 A Florida wildflower guide can help you to identify these beauties. Let them grow where you can, or transplant them creating a large a patch and mow around them. 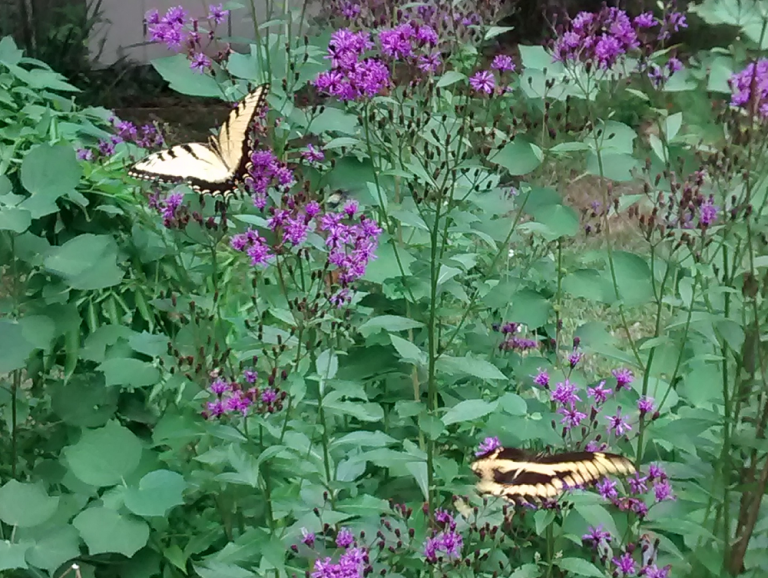 The butterflies will appreciate it PLUS they are free and usually can be found in your yard … or a friend’s. Remember, when transplanting, to remove any flowers or fruit and all but a few leaves so that the plant can recover from the shock more quickly. Bidens alba is a perennial wildflower reaching 3 to 4 feet in height. The white blooms appear all year. It is found in open woods and disturbed sites. It grows in full sun to part shade with average moisture. Cephalanthus occidentalis is a woody shrub reaching 10 feet in height. The white flowers appear in the spring, summer & fall. It is found in marshes, pond edges, and stream banks. It grows in moist soil with full sun. Cnidoscolus stimulosus is a perennial wildflower reaching 2 feet in height. The white flowers appear all year. It is found growing in open woods & pinelands. The foliage has stinging hairs so wear gloves if transplanting this one. Also, the root is usually about a foot down so be sure to dig deep enough to get the tuber like root. I realize that many of you think this is not a worthy plant, but in late winter when little else is blooming the butterflies rely on this plant a great deal for nectar. Elephantopus elatus is a perennial wildflower reaching 3 feet in height. The purple flowers appear in the summer & fall. It is found in pinelands & open woods. It grows in average to moist soils with full sun to part shade. 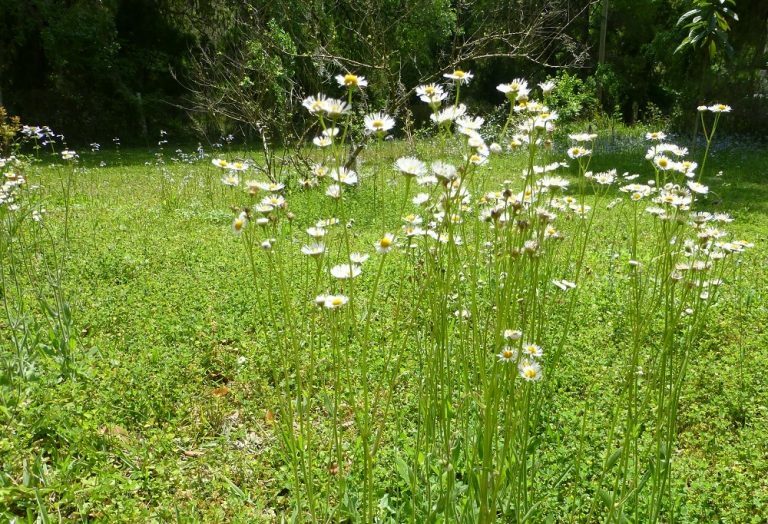 Erigeron quercisofius is a perennial wildflower reaching 2 feet in height. The white flowers appear in the spring, summer & fall. 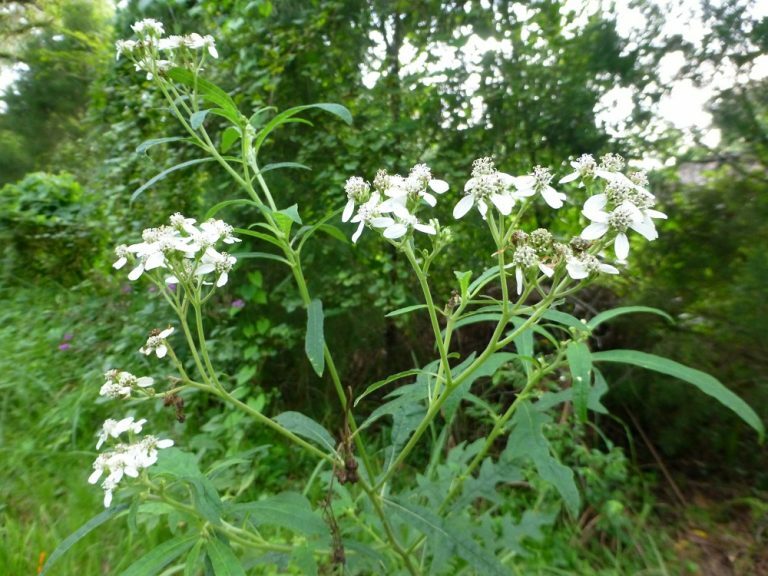 It is found growing in open woods & pinelands. It grows in full sun to part shade with average moisture. Transplant this with as much original soil as you can keep around the roots. Erythrina herbacea is a deciduous shrub reaching 15 feet in height. 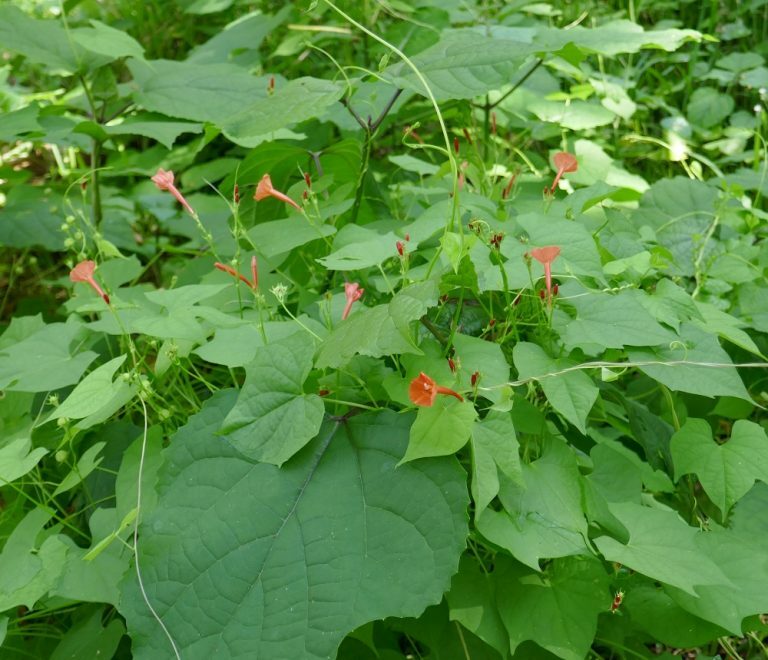 The red tubular flowers appear in the spring & summer. The flowers are also enjoyed by hummingbirds as well as butterflies. 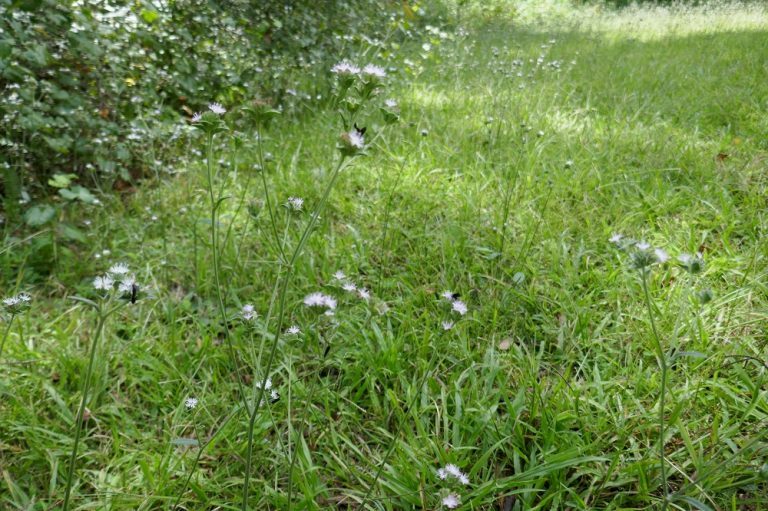 It is found growing in open woods and roadsides. It grows in part shade to full sun with dry to average moisture. Transplant the tuber. 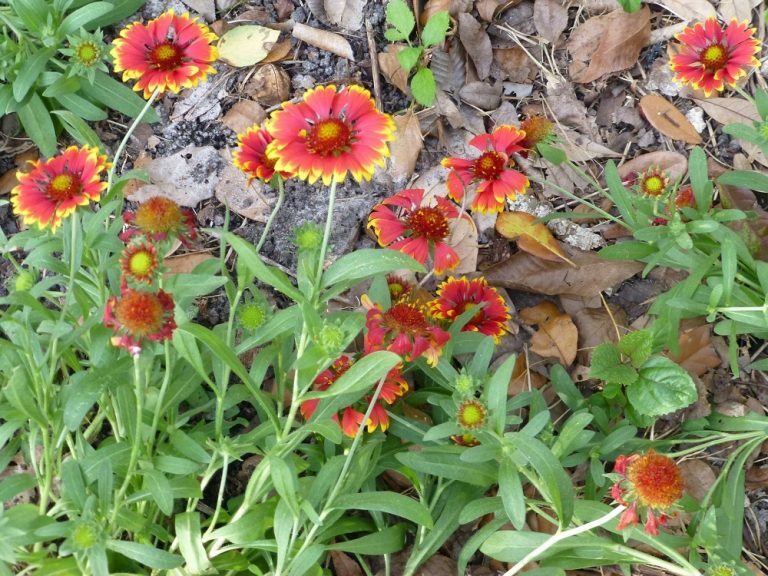 Gaillardia pulchella is an annual wildflower reaching 2 feet in height. The orange & yellow flowers appear all year. It is found growing in coastal areas & along roadsides. It grows in full sun with average moisture. It will re-seed itself. 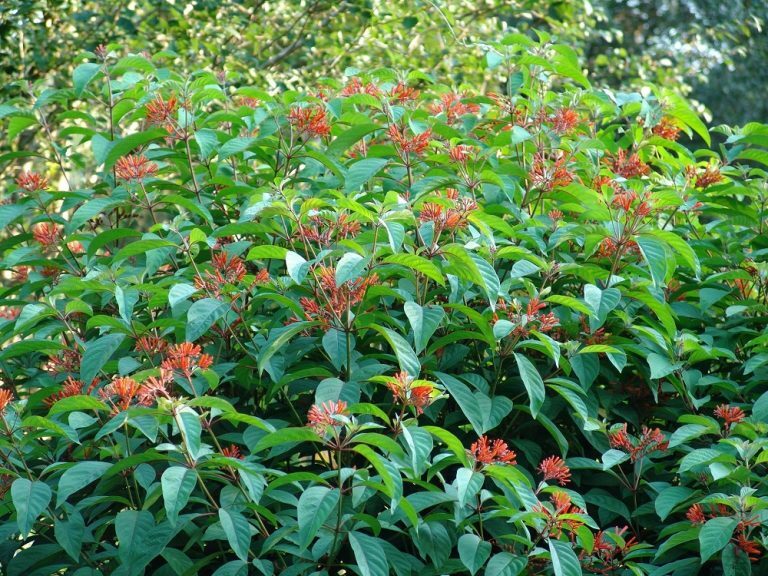 Hamelia patens is a deciduous shrub reaching 10 feet in height (more if it does not freeze). 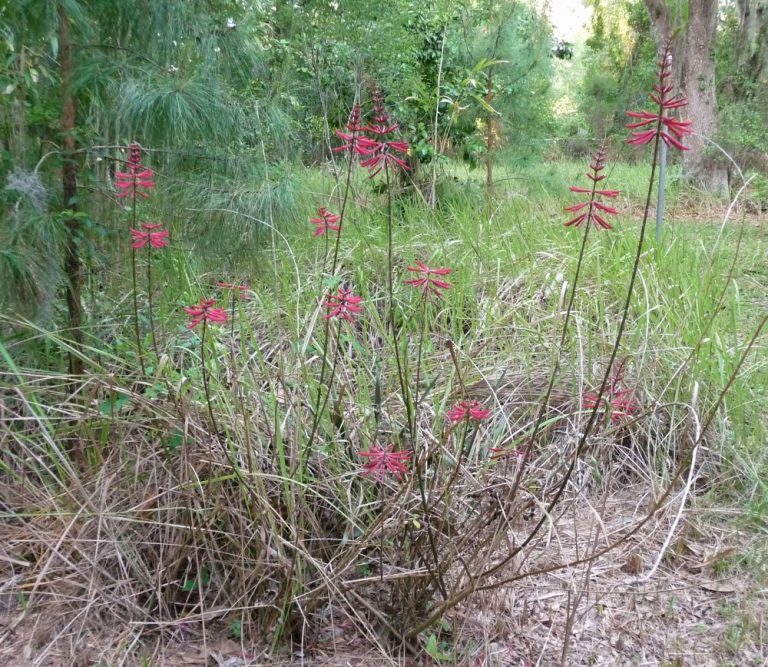 The red tubular flowers appear all year if a freeze does not occur. The flowers are also used by hummingbirds. It is found in hammocks & disturbed sites. It grows in full sun to part shade with average moisture. Ipomoea cordatotriloba is an annual herbaceous vine. The purple flowers appear in summer & fall. It is found in thickets & disturbed sites. It grows in full sun to part shade with average moisture. It will re-seed itself. This vine is best started from seeds. Ipomoea herderifolia is an annual herbaceous vine. The red flowers appear in spring, summer & fall. It is found in thickets & disturbed sites. It grows in full sun to part shade with average moisture. Hummingbirds also use the flowers for nectar. If you left seeds on the vine they should sprout in the spring and provide new vines. Liatris spicata is a perennial wildflower reaching 3 feet in height. 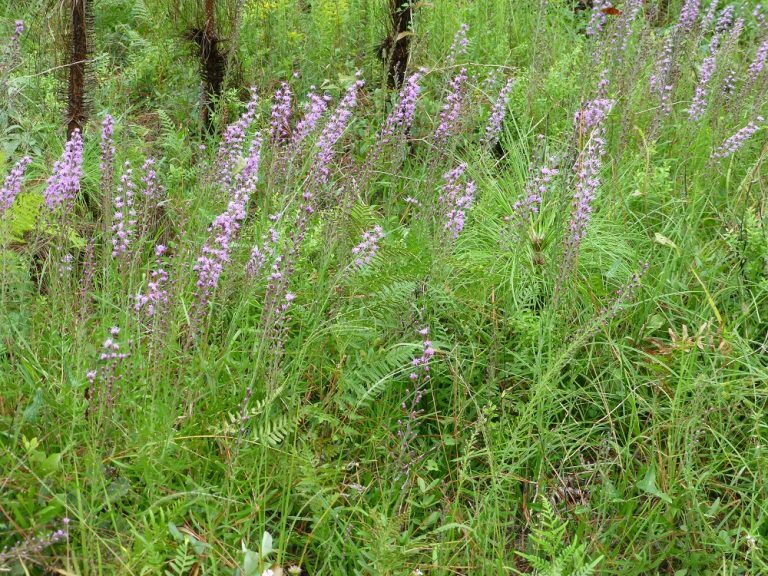 The purple flower spikes appear in the summer & fall. It is found along roadsides, pinelands and sandhills. It grows in full sun to part shade with average moisture. When moving these bulbs be sure to cut off the flower, or seed, stalk to help it survive the shock of transplanting. 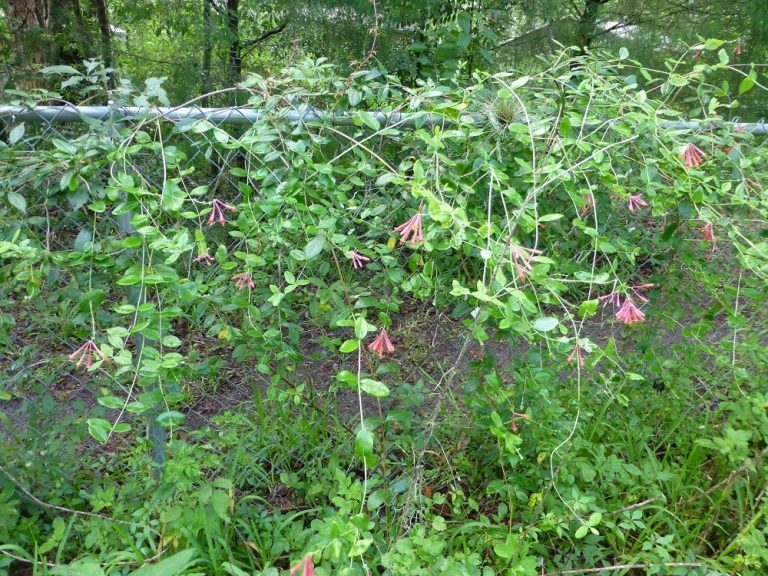 Lonicera sempervirens is a woody, evergreen vine. The red flowers appear in the spring & summer. 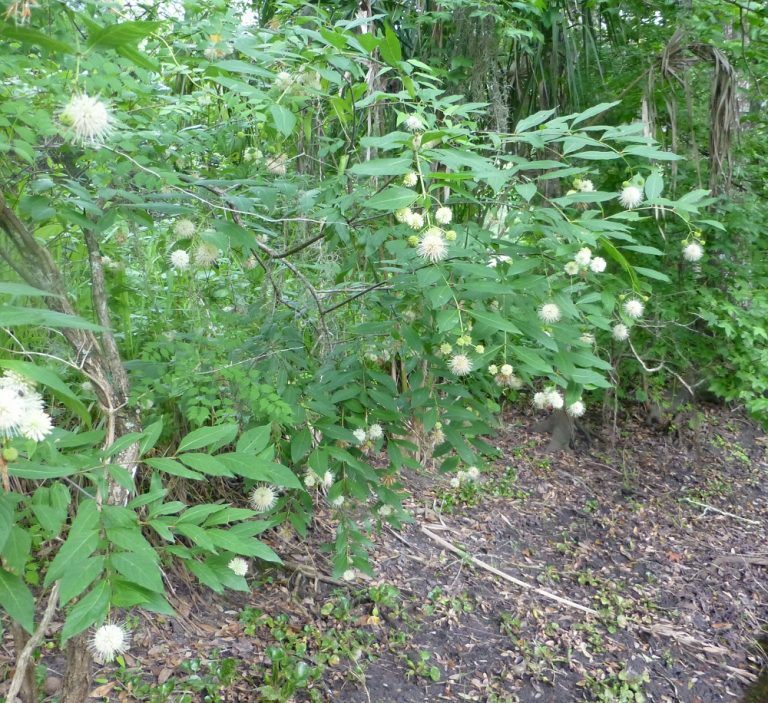 It is found in open woods, thickets and fence lines. It grows in full sun to part shade with average moisture. Hummingbirds also use the flowers for nectar. 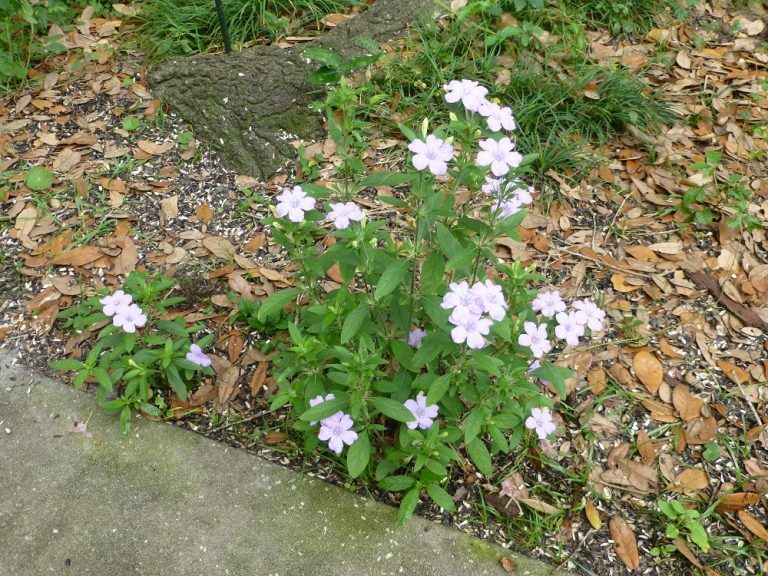 Ruellia caroliniensis is a perennial wildflower that reaches 1 foot in height, and can spread to become a ground cover. It tolerates part shade to full sun with dry to average moisture. It has lavender blooms. 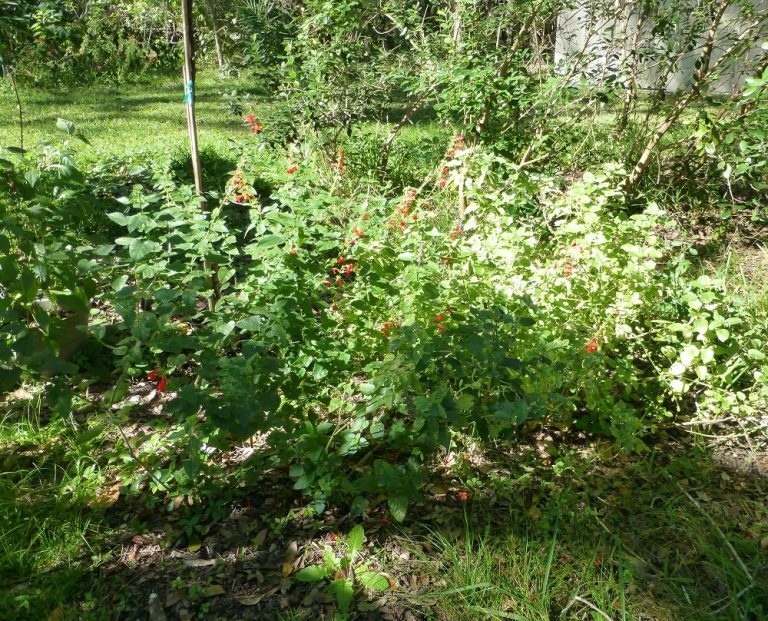 Salvia coccinea is a perennial wildflower reaching 2 feet in height. The red flowers appear all year. It is found in open woods & disturbed sites. It grows in full sun to part shade with average moisture. Hummingbirds also use the flowers for nectar. It will drop seeds where the original plant was and new seedlings will sprout for transplanting. Verbesina virginica is a perennial wildflower reaching 6 feet in height. The white flowers appear in the spring, summer & fall. It is found in open woods & disturbed sites. It grows in full sun with average moisture. Vernonia gigantea is a perennial wildflower with purple flowers that appear in the summer & fall. It is found in pinelands & open woods. It grows in full sun to part shade with average moisture.